The key to success in any venture, is to decipher which tools produce the right result for the job. If you are overwhelmed by the various software options on the market, as well as utterly lost as to which company to go to for marketing assistance, look no further. At Spinnsoft Marketing Solutions, we offer versatile tools and services to assist in every aspect of gallery business operations under one roof. Our team consisting of digital marketing experts, programmers, designers, and web professionals, have decades of experience in their chosen fields who have worked with notable companies such as Intuit, Symantec, Autodesk, Nike and more. Best of all, Spinnsoft Marketing Solutions is no flash in the pan. We have been working with art industry professionals for the past 20 years and we fully understand the inner workings of the art gallery business. Give us a call today to discuss how we can help your business succeed. Not only does Spinnsoft offer one of the best gallery management solutions available, we also feature a complete marketing team of experienced web and design professionals in-house, each with over 20 years of corporate marketing experience and a client list of many Silicon Valley companies such as Intuit, Symantec, Autodesk, Nike and more, plus a group of talented programmers and support staff. Our Spinnsoft-driven web products range from affordable, quick Pre-Designed sites which are fully Google compliant and mobile-friendly to complete, custom-designed sites complete with e-commerce and advanced marketing features. Please see some examples below and call us for more information. Start with a Pre-Designed site and grow into a custom Spinnsoft web solution. 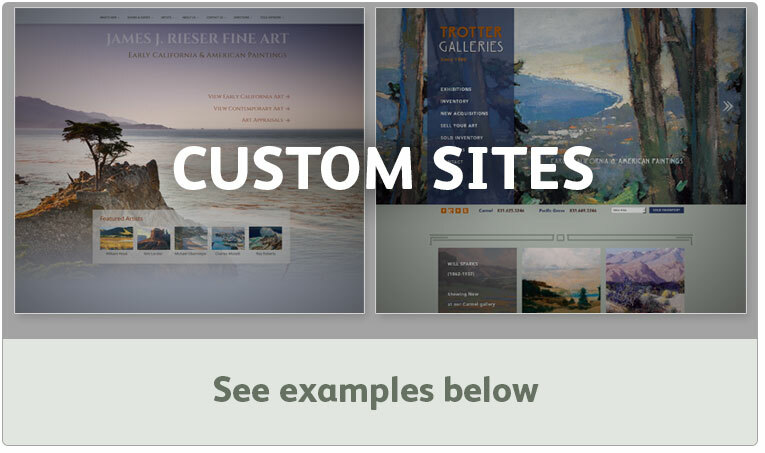 Although the design possibilities and functions of the Pre-Designed sites are limited, they are the base of designing a custom, high-end website for your gallery business and is a great way to get started with becoming Google compliant, improving SEO rankings, and improving marketing results from your website. 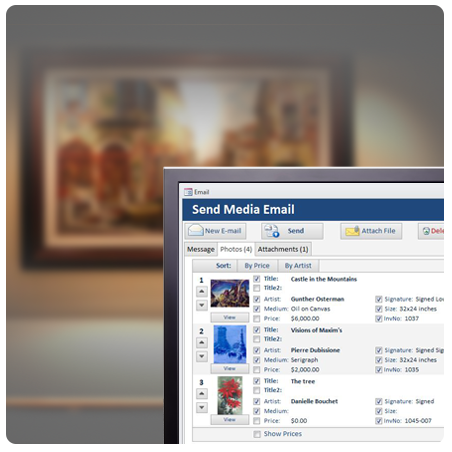 Spinnsoft Gallery is not just another art inventory management software. Unlike most other software for galleries, the primary focus of Spinnsoft Gallery is not to inventory your art, but to help you sell your inventory. By integrating all your vital information in one place, we help you to identify target clients who would be most likely to add your specific inventory to their collection. We also add in many tools to help you keep in regular touch with all your collector clients and attract new clients through our integrated website tools. Spinnsoft is a complete toolbox; it also handles the "boring" business side of the gallery quite well, such as inventory, financial reports, consignments, invoices, shipping, costs, etc. But if you are not focusing on the sales aspects with Spinnsoft Gallery, you would be missing the most important piece! 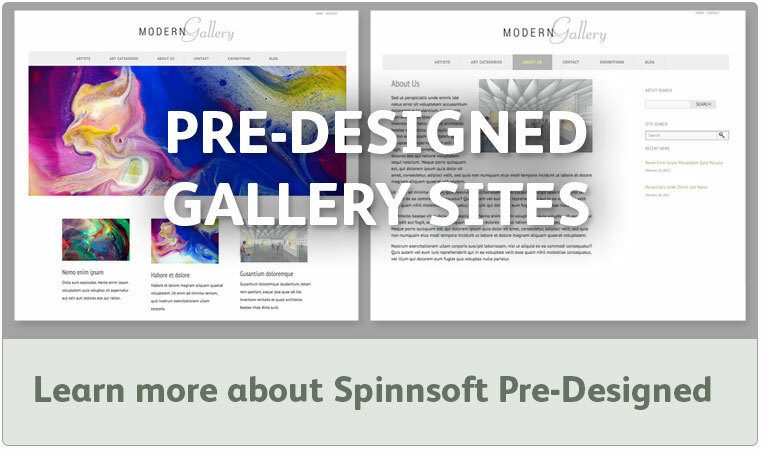 With our 20 plus years of experience working with the art industry, Spinnsoft Gallery Software is being touted by notable galleries and publishers as the most relied upon software for success. It was designed by years of input from hundreds of successful gallery owners, directors and art consultants, creating a program packed with sales and operations knowledge. "I cannot imagine running a gallery without Spinnsoft Gallery software…"
© Copyright . Spinnsoft, Inc.